Product code: W1407 Categories: Rolex Watches, Watches. The Rolex Cellini range was brought out by Rolex as an elegant watch going away from their larger Rolex Oyster cases, and here is a very elegant unisex 18 carat white gold Rolex Cellini 4135 with box and papers. 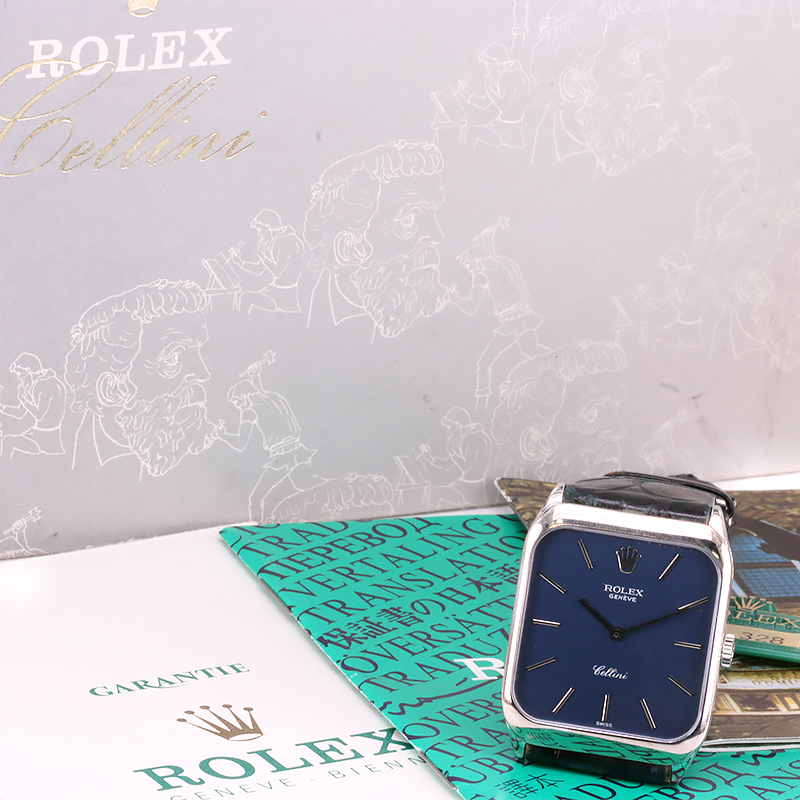 With the blue dial being such a stand out feature on this watch, the elegance is continues with its sleek and stylish slim index markers and minute and hour hands. All of this is complimented by the 18 carat white gold case which measures 36mm by 26.8mm plus the Rolex crown and even though it has a mechanical movement, it is so lovely and slim and sits perfectly on the wrist. This is easily a watch that will look good during the day, in a business meeting, or while fine dining. Inside is the 19 jewelled Rolex manual wind calibre 1601 that has been fully serviced and comes with our twelve month warranty, and will never let you down. 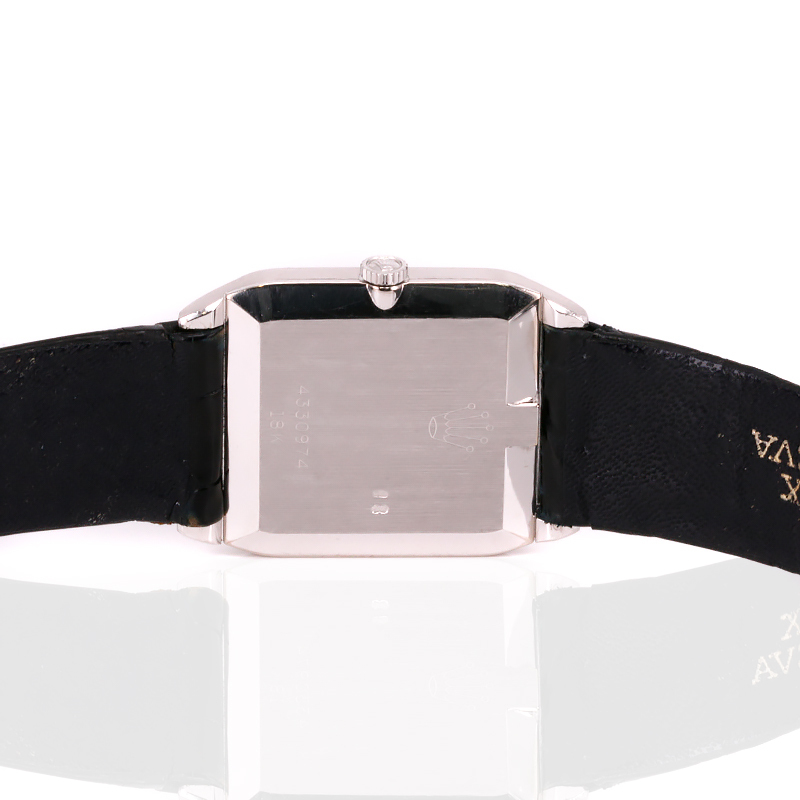 Fitted on its original Rolex black leather band, it also retains its original Rolex buckle. And not only does this watch come complete with its original box, papers and instructions, but it also comes with its original Rolex swing ticket which amazingly still has its original price sticker from 1990 on there of $5,328. To get a complete set like this with its original band as well is practically unheard of, and a real find that completes the package for this beautiful watch. The Rolex Cellini is such an elegant watch, and this example here truly exemplifies this. 18 carat white gold Rolex Cellini 4135 with box and papers. This Rolex Cellini has the manual wind Rolex calibre 1570 inside. Complete with its original Rolex band and buckle, it also has its original box, papers, instructions and Rolex swing ticket with its original price. The Rolex Cellini was named after the famous Italian goldsmith and sculptor, Benvenuto Cellini (1500-1571). An artist during the Renaissance, he was one of the most important artists of his time. The Rolex Cellini was a classic alternative to the sporty Rolex Oyster collection. Rolex launched a number of Cellini models throughout the course of its history, and has remained its classically styled dress watch.